Cherry Jackpot Casino is a new online gambling site for Canadian players in 2018 and they have an amazing welcome package for all new players. You can get up to $20,000 in free money with their introductory bonuses. The Cherry Jackpot Casino bonus is 200% up to $2,000 on your first 10 deposits. You need to use the coupon code CHERRY200 and this bonus is only for use on slots games. The wagering requirements are set at 40x. If you're not a slots fan, don't worry, you can get a 100% first deposit bonus up to $1,000 for all games instead. The coupon code for this bonus is CHERRY100 and the wagering requirements are 40x. You can play all the casino games except for baccarat, craps, roulette, sic bo, and war. The terms and conditions for these welcome bonuses can be found on the promotions page of the casino website. We would have loved to have seen a no deposit bonus or free spins offer as a welcome bonus on this new casino, but once we saw the huge number of regular promotions available, it didn't seem to matter that these were missing. There are daily bonus deals for slots and table games fans. You can get a 70% bonus every day to play slots and a 60% bonus for all other games. There's also the Free Spins Frenzy promotion that will get you 20 free spins on the Big Blooper slot as well as a 65% bonus. You can claim this once every day if you want. There's also a 50% deposit bonus that you can claim every time you make a deposit. The Bonus Maximizer promo is for high rollers and the more you deposit the higher your percentage bonus. Cashback of up to 40% of your losses is available weekly too as well as a 75 free spins weekly bonus. Voucher codes for all these offers can be found on the promotions page of the Cherry Jackpot Casino along with information on special deposit method bonuses too. There really are so many great offers to choose from with every deposit you make so make sure you choose the ones that will match your gaming needs. There are a lot of countries that are restricted from opening an account at Casino CherryJackpot. These include Australia, Austria, Belgium, Bulgaria, Costa Rica, Croatia, Curacao, Cyprus, Czech Republic, Denmark, Estonia, Finland, France, Germany, Greece, Hungary, Ireland, Israel, Italy, Latvia, Lithuania, Luxembourg, Malta, Netherlands, Poland, Portugal, Romania, Russia, Slovakia, Slovenia, Spain, Sweden, and the United Kingdom. Canadian players are very welcome and we're sure you'll agree this is a great casino to play at. Cherry Jackpot Casino is powered by world famous software provider Realtime Gaming. RTG casinos have a great reputation and the software is available in no download instant play. You can enjoy all the games on PC, Mac, or mobile and you can play demo versions using the fun play option too. There isn't a dedicated mobile casino app but when playing on iPhone, iPad, or Android device, all the games will run in your browser. The main language of this casino is English. When it comes to games there are hundreds to choose from and all the best RTG slots and table games are included. There isn't a live dealer section but perhaps this will be added at a later date. The game categories include slots, new games, progressives, specialty, table games, and video poker. In the new games category, you'll find slots like Panda's Gold, Stardust, and more. In the slots category, you can choose your game based on the number of reels, bonus features, or progressive jackpots. There are 3 reel, 5 reel, and 6 reel slots and all the best RTG titles are included such as Cleopatra's Gold and Penguin Power. The table games section includes a number of blackjack variations, poker games, baccarat, rummy, pontoon, pai gow, Caribbean stud, and more. If you are a fan of roulette games you'll have to visit the specialty section. This is where you will find scratch cards, keno and bingo, and roulette. The Video poker section has plenty of great choices too and you can select the games by the number of hands you can play. There are 1 hand, 10 hands, 3 hands, and 52 hand games available to suit every budget player. Titles include Bonus Poker, Jacks or Better, Deuces Wild and more. If you're a fan of progressive jackpots, you are in for a treat. There are six progressive jackpot titles to choose from at CherryJackpot. These are the most popular RTG progressives and titles include Aztec's Millions, Megasaur, Let' Em Ride, Caribbean Stud Poker, Spirit of the Inca, and Caribbean Hold'em Poker. These games can make you an instant millionaire and the current prize amount is listed beside each of the titles. The biggest progressive jackpot paid out on a Realtime Gaming slot to date came in December 2017 when a lucky player at Bovada Casino won $1,557,930 on the Jackpot Pinatas slot. The highest payout on one of the progressives available at CherryJackpot Casino came in December 2016 on the Megasaur slot and a lucky player won $1,077,774. There are no complaints to report on. We will be keeping an eye on things and will update this section if necessary. Because there are no complaints and the site is licensed and regulated and offers a huge range of promotions, we have given it a rating of 5 out of 5. We will monitor things closely and adjust this should the need arise. 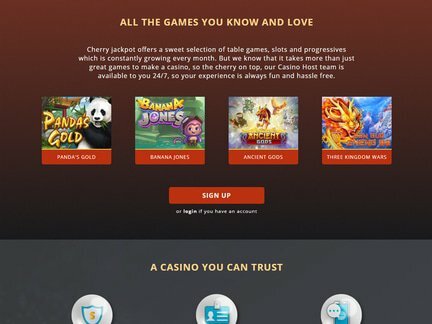 Cherry Jackpot Casino is a new player in the online gambling industry and launched in 2018. The site is licensed and regulated by the government of Curacao. The casino owners also operate Roaring 21 casino and Casino Max so if you've played and enjoyed either of these you will enjoy Casino CherryJackpot and what they offer too. Security and fair gaming are taken very seriously and all RTG games have a fair gaming seal of approval. The Cherry Jackpot Casino is very easy to navigate and all the information you need can be found in a click. The promotions page is packed full of great deals and offers and new players can enjoy the fantastic CherryJackpot Casino bonus. There's a 200% bonus up to $2,000 available on your first 10 deposits if you want to play slots games. Table games fans can claim a 100% up to $1,000 bonus. There are coupon codes to use and these are clearly displayed on the website. There isn't a no deposit bonus but there are plenty of free spins available for slots fans. RTG games are excellent and you can play everything on mobile and desktop and their games run really smoothly in your browser. I enjoyed playing the progressive jackpot slots even though I didn't hit the jackpot. The bonus slots games are great too with lots of great features. There are plenty of banking options and customer support is available 24/7. All in all, this is an excellent new online casino and I am happy to recommend the site to all Canadian players.